Place coconut into a small bowl and cover with water, soak for 10 minutes. Drain. Heat a fry pan, add 1 tablespoon oil. Cook shallots, chilli and kaffir until golden and caramelized. Add coconut and fry for a further minute. Set aside. Heat large fry pan and half the oil, add half potatoes, and fry until golden. Repeat until cooked. Season the fried potatoes with a little flakey salt. Layer the salad ingredients together in a bowl and squeeze over lemon juice. Cook fish in large fry pan, spray with oil. Lay fish fillets spice side down and cook for 2 minutes. Turn and cook for a further 1- 2 minutes until cooked. Divide the coconut crust amongst the fish as a topping. Serve directly from heat with side of simple salad, fried potatoes plus wedge of lemon. NOTE: Oil substitutes could be Grape seed oil canola or sunflower oil. *Replace kaffir leaves with fresh new lemon leaves or try lemon basil or plain basil. Place mat, wood bowl, white beaker, blue & white plates, cutlery, Freedom – Wairau Park. Napkin, The Importer, Wairau Park. Linen stylists own. Roast peanuts in hot oven for 8–10 minutes until lightly golden. Add to processor or blender with garlic, soy, salt and lime juice – blend to a paste. Add a little coconut milk at a time until thick sauce consistency. Assemble satay sticks; thread beef onto sticks. If schnitzel cut very thin, double the thickness while threading on sticks. Bring water and lemon grass to boil, add rice, cover, cook on low by absorption method for 12 minutes. Remove from heat and leave covered for 5 minutes. Preheat BBQ plate and wok to high heat. Cook beef for 3–4 minutes each side and place then put onto serving platter. Add oil to wok and stir fry beans for a few minutes, add tomatoes and toss quickly to cook. 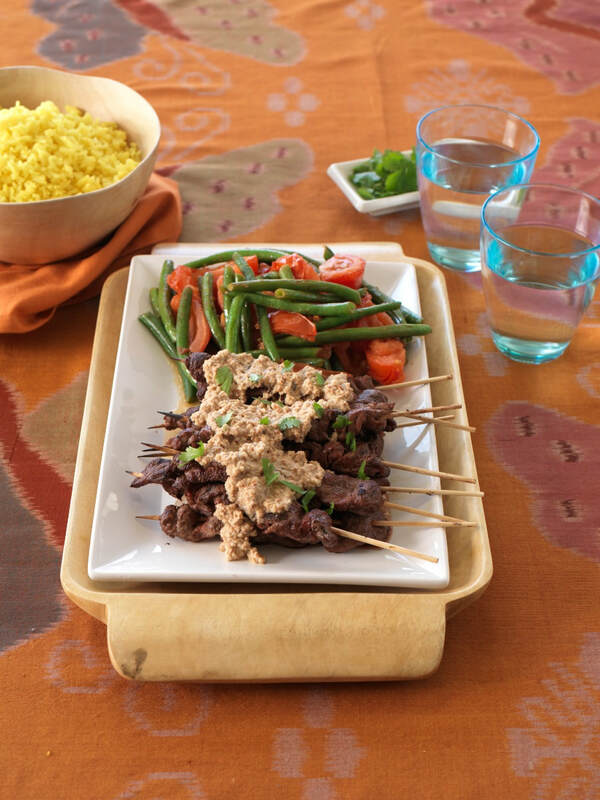 Pour a little satay sauce over beef sticks to serve alongside yellow rice and stir fry vegetables. NOTE: * If using fresh turmeric then mix into half cup water and drain before adding to rice to soak. 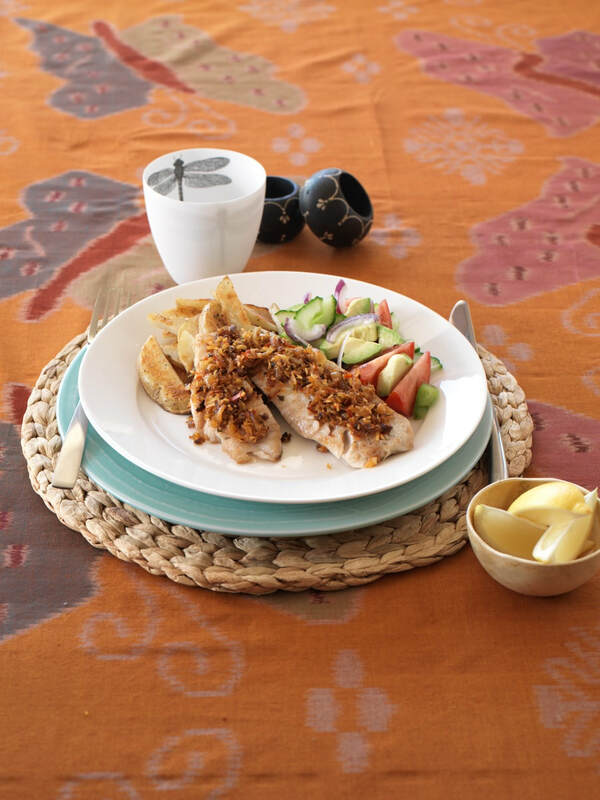 **Add 1–2 small fresh chilli’s to satay sauce recipe, season with fish sauce for extra flavour. Platter, wood plate & bowl Freedom, Wairau Park. White dish, orange napkin – The Importer, Wairau Park. Linen stylists own. Combine first 4 ingredients to make sweet sauce. Heat 1 tablespoon of oil in large fry pan or wok. In batches fry the tempeh until crispy then remove from wok. Add sweet mix to wok and cook for a minute. Add tempeh and toss through to coat. In clean hot wok add remaining tablespoon of oil. Fry shallots until crispy. Set aside. Fry spice paste in wok for a minute or so. Add vegetables one lot at a time and toss to cook for a couple of minutes. Add a little water as you go to create steam and speed up cooking process. Add cooked egg noodles to the wok of vegetables, toss through until well heated. Kecap Manis is a sweetened thickened version of soy sauce- as an alternative try using a mix of soy sauce and honey. For authentic Sambal topping fry 2 sliced long red chillies together with shallots until crispy. 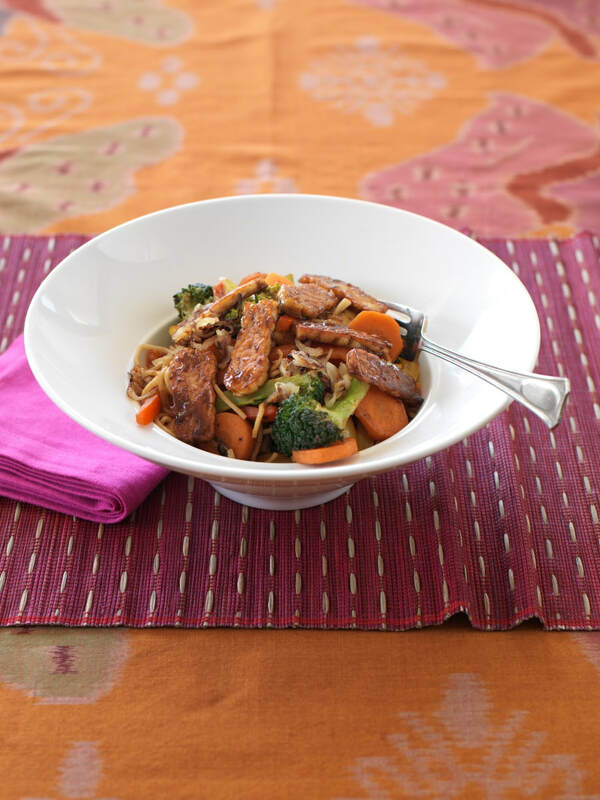 TONZU Tempeh is New Zealand made; one of the few vegetarian sources of vitamin B12, is high in protein, and low in saturated fats, with absolutely no g cholesterol. Step 1 Cut chicken pieces into quarters, place into a bowl. Add the spice paste and toss well to coat. Finely grind the lemon grass with a little water into a paste using a mortar and pestle or small blender; add to the chicken and toss through. Bring water to the boil, add brown rice, red lentils a little salt. Cover, turn to low to cook for approximately 25 minutes by absorption method. Stand for 5 minutes with lid on. Spray a hot BBQ plate or fry pan with oil. Toss the chicken on, turn to medium heat and cook for 3- 4 minutes on each side. Depending on thickness of chicken- it may need a little more. Remove, place in oven proof dish, cover and rest. Add half of peanut oil to hot wok. Cook the shallots until crunchy, remove. Heat remaining oil in wok, add ginger and cook gently for a minute, add all the spinach, toss then cover and cook until wilted. Add shallots back to spinach to serve. 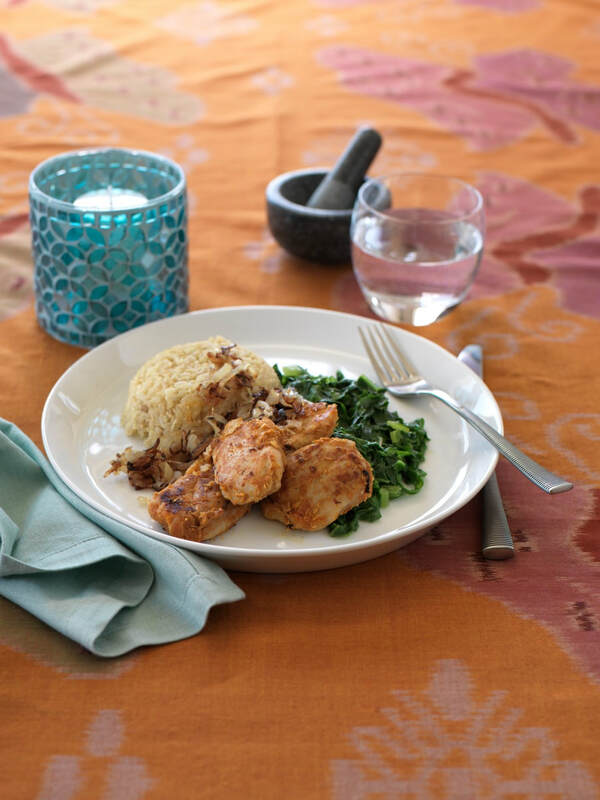 Serve the chicken with its juices alongside a timbale of rice, lentils and pile of spinach. NOTE: Fresh lemon grass can be substituted for 4 tablespoons of preserved lemon grass- finely chopped. OR add 4 fresh, new soft lemon leaves or kaffir lime leaves, finely sliced. Candle, mortar & pestle, plate, cutlery Freedom – Wairau Park. Napkin The Importer – Wairau Park. Glass, linen cloth stylists own.